Amazon announced today a new section will soon be added to the Kindle Store for “Kindle Singles”. No, it’s not a dating website for single Kindle owners looking for romance. 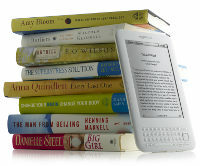 Kindle Singles are ebooks ranging in length from 10,000 to 30,000 words, or about 30 to 90 pages. Works of these lengths are generally considered novellas and novelettes, and are generally harder to get published because they are too long for magazines and too short to be a novel, so they usually end up in some sort of collection or compilation. Most short stories are under 10,000 words and a novel is typically 50,000 words at the very minimum. So this should open up more possibilities for writers getting novellas published. Today, Amazon is announcing that it will launch “Kindle Singles”–Kindle books that are twice the length of a New Yorker feature or as much as a few chapters of a typical book. Kindle Singles will have their own section in the Kindle Store and be priced much less than a typical book. Today’s announcement is a call to serious writers, thinkers, scientists, business leaders, historians, politicians and publishers to join Amazon in making such works available to readers around the world.